As most of you know TeeTransfers makes and sells iron on transfers for applying to T-Shirts, Hoodies, coats, flags, underwear...pretty much anything made from cotton/polyester. But did you know, that many of us, after working in the garden will chuck away old soiled tops if the stain will not come out in the wash.
For all of you who have young children, baby tops can get pretty messy and stain very quickly. Throwing them in the bin can seem to be the only option! 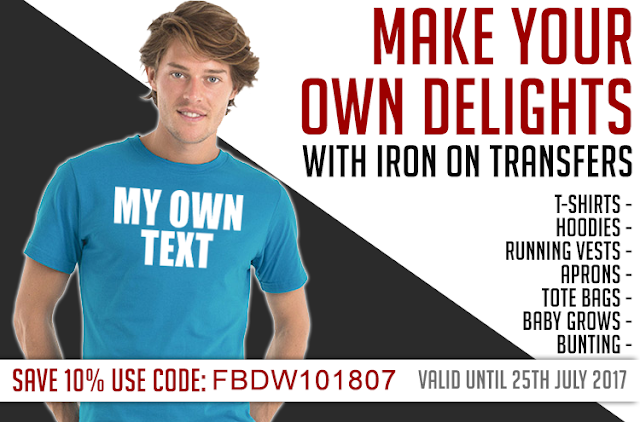 Why not use Iron on Transfers to cover the mess, and give that old t-shirt / sweater / baby grow a new lease of life. At TeeTransfers we sell everything from stars, to cars, numbers to letters, animals to space ships, so we're pretty sure you can find something that will not only be a cheap iron on transfer, but will transform that once dirty top in to a great top which can be washed at 40 degrees! 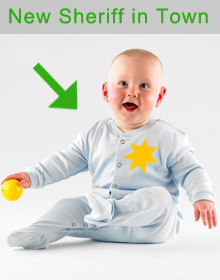 Lets take this baby top for example, after a few meals the baby grow looks awful, its got a great big ketchup stain! After washing with all the top named brands the stain is still evident. Instead of throwing it in the bin - why not just cover the stain! Measure the size of the stain and then buy a transfer in a larger size. Make sure the item of clothing has been washed (so any solids are no longer there) and then just iron on - using the iron on instructions on our website. Now we have a lovely baby Sheriff costume which cost only 75p! (exc P&P). The list does not end there, if your own a second hand clothes shop and and have received clothing that has small oil stains, providing the iron on transfer is larger than the stain - you can create a new look and give the item of clothing a new lease of life for very little money - and increase the resale value. Its a great way to save money, and its fun too!